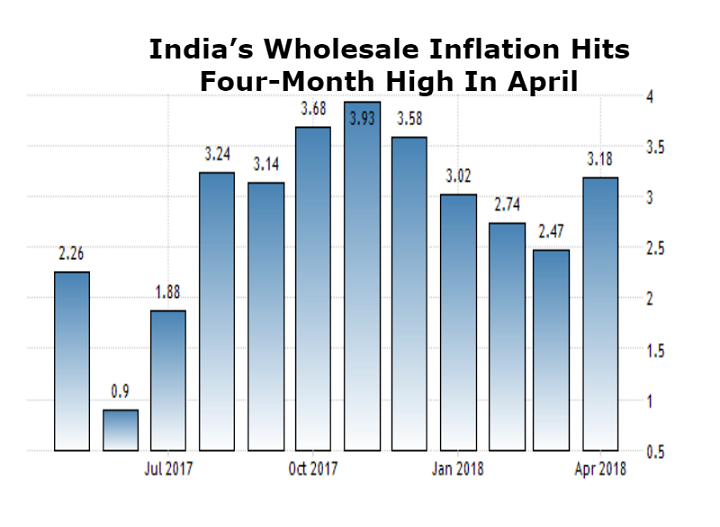 INDORE, India - May 14, 2018 - PRLog -- On Monday, the Wholesale Price Index (WPI) data revealed for the month of April indicating a 4-month high figure of 3.18 percent, due to higher fuel and food product prices. In February and March 2018, the WPI was 2.48 percent and 2.47 percent respectively. In the equivalent month the previous year, the WPI inflation was a little bit higher at 3.85 percent as compared to the figure for the latest month. WPI for all Commodities with base 2011-12 for the April month has provisionally increased by 0.7 percent from 116.0 for the previous month to 116.8 for April month. Build-up inflation rate has also gone up 0.69 percent so far in the ongoing financial year as compared to zero percent during the same period last year. Primary articles with a weightage of 22.62 percent in the overall WPI index also provisionally increased 1.4 percent to 129.2 against 127.4 in the previous month. Within the category, index of food items also rose 1.9 percent on account of increase in the price of peas (13 percent), tea (18 percent), fruits and vegetables (8 percent), pork, paddy and maize (1 percent each) and fish and other marine items (4 percent). On the other side, the index for non-food items witnessed a fall of 0.9 percent on account of decrease in the price of raw silk (9 percent), floriculture (7 percent), Niger seed (6 percent), Gaur seed (5 percent), Groundnut seed and linseed (4 percent each), raw rubber (3 percent), cotton seed, castor seed and Gingelly seed (2 percent each) and hides, safflower and raw cotton (1 percent each). Crude Petroleum & Natural Gas group index also registered a rise of 2.4 percent to 82.1 provisionally with the increase in the price of crude petroleum and natural gas. Fuel & power category, which has a weightage of 13.15 percent in the total WPI index, has also provisionally increased by 0.9 percent to 98.9 percent.